Stew says it was a no-brainer to use Lifemark principles. Andrew had grown up with Stew using a wheelchair, so had an idea of what he needed. First on the list for Stew was internal access from the garage, plenty of turning space for a wheelchair and wide hallways. The entry lobby now leads to the stairway and a water-powered elevator at the end of the hall, the only carpeted space in the house. 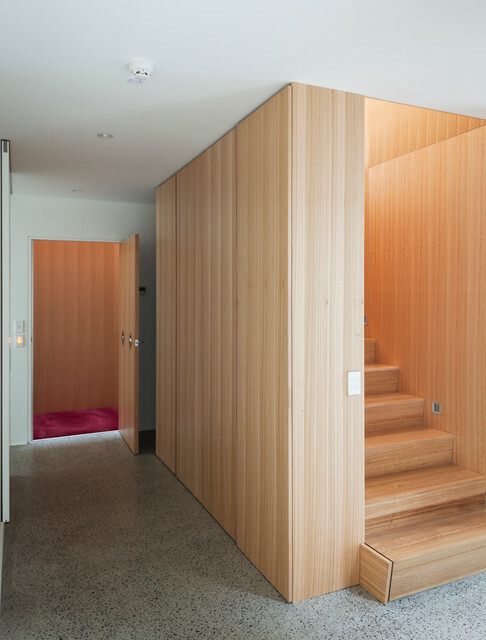 The house’s odd wedge shape fits snugly into the hill, with space for a ground-floor courtyard and upstairs deck.